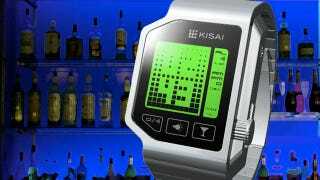 Tokyo Flash's back with the crazy watch concepts, this time with something that alcoholics should probably consider: a breathalyzer watch. It tells the time, sure, but more importantly gives you a blood alcohol reading so you know your true drunkenness. Instead of reading your BAC by osmosis, the watch has a port that lets you blow into it, with the touchscreen displaying your reading after it's gauged how much you've had to drink.